I was thinking about how when I got into one thing as a child it often got me interested in something else. So how to did I get from Lego bricks to System Design, PowerShell and Sci-Fi? What we need, is a flow chart! To the Bat-Publisher! (below the line). My mum was a keen reader and I got a lot of encouragement. We also had buckets of standard Lego and the occasional bit of technical stuff which my dad helped with. The stage was set! I got a Lego train-set when I had my tonsils out (was in the hospital for a couple of days; this was back when the Government allowed you to stay in bed until you were fully well like some sort of commie, bed-blocking malingerer). I remember getting a real sense of joy out of how all the systems worked together. Sci-Fi was creeping up on me as well; the regular dives behind the TV whilst watching Doctor Who lead me to read the comics. This in turn brought me to the always brilliant 2000 AD and eventually some Marvel comics. My uncle took my brother and I to the cinema regularly which was always brilliant and around this time was when I first saw Star Wars in the cinema. Mind. Blown. Personal computers were starting to get into the news and I was keen to try programming one. Just before secondary school I got the original, rubber keyed ZX Spectrum with it’s whopping 48K of memory. More than anyone would ever need! A lot of kids were getting them and trading games in school. I also got a subscription to a programming magazine though (Byte?) and started to try and understand how they worked. I was reading a proper bit of literature. Luckily for my future self she decided to let sleeping worgs lie. During my time at secondary school everything moved on. Our computer went from a Spectrum, to a Commodore 64 and then on to an Amiga A500. Games Workshop came to the UK and I started getting into more and different role-playing and board-games. This was back when Games Workshop were a general stockist of games and hadn’t started selling their own stuff. 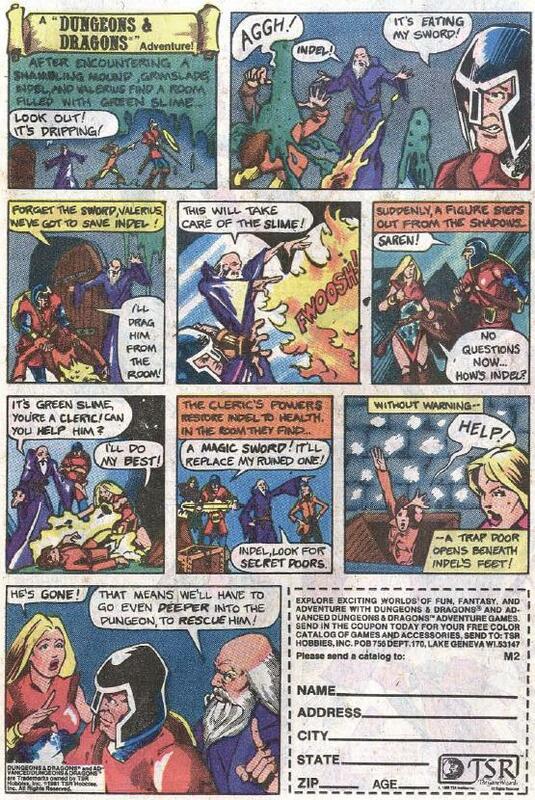 White Dwarf and Dragon magazine were staples. My brother and I got a Sega Master System one year for Christmas which was pretty awesome; I didn’t really get into console gaming again until I was much older with the advent of the Playstation though. I was introduced to a wide range of musical influences by the ‘Mix Tape’ method among my class-mates. I was into every kind of music; both Rock AND Heavy Metal. During my late teens that developed into me learning to play the guitar, or rather learning to play along to music I liked. I went to an all-boys Grammar school so my nerdy development wasn’t interrupted by girls until I was quite a bit older and roaming the streets at night. Finding girls into geeky stuff had to wait until I got to University though. Two major events happened just before I went to University; I got a PC for the first time and I started reading Empire magazine. The former opened my eyes to how much you could fiddle around on a computer (and how much trouble you could get yourself in) and the latter got me into films that weren’t some combination of aliens, lasers and space-ships. PC gaming was my version of hot-rodding. Tweaking configuration files to get games to run (or run better) was a constant activity. Loads of hours were squandered playing Master of Orion, XCOM and Ultima with friends. You hear that Mr Anderson? 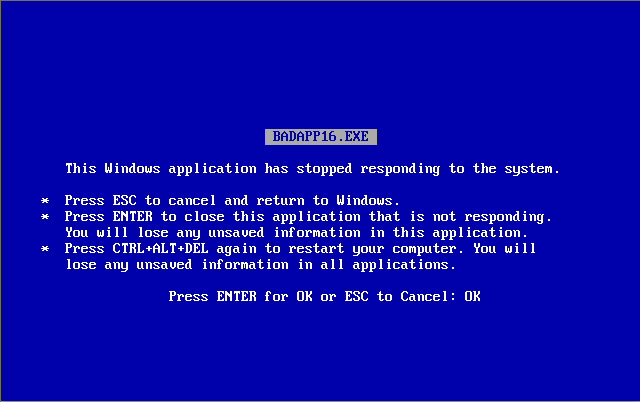 That is the sound of inevitability. I met my future wife of awesomeness as well and she got used to me talking rubbish and mucking about with technology. Neither of those activities have changed much to be honest but she’s still willing to listen. On our wedding day one of my friends described her as ‘being able to hang with the geeks without being a geek herself’; i.e she knows what a light saber is without knowing how to build one. The utility of the Internet was drilled into me then too; no WWW yet but the ability to ask for input on projects from people on the other side of the world was pretty cool. Having a degree got me my first job but it was really the configuration of my PC and the constant tweaking that allowed me to actually do it. From desktop support I picked up a bit of UNIX but the real leap was when I volunteered to support the email system. Email relies on pretty much everything so I learned about pretty much anything; DNS, networks, the directory service, server hardware, SAN and disk configuration, proxies and reverse proxies, firewalls, web interfaces, Internet standards and whatever was needed. From there I was able to work on all sorts of interesting things. 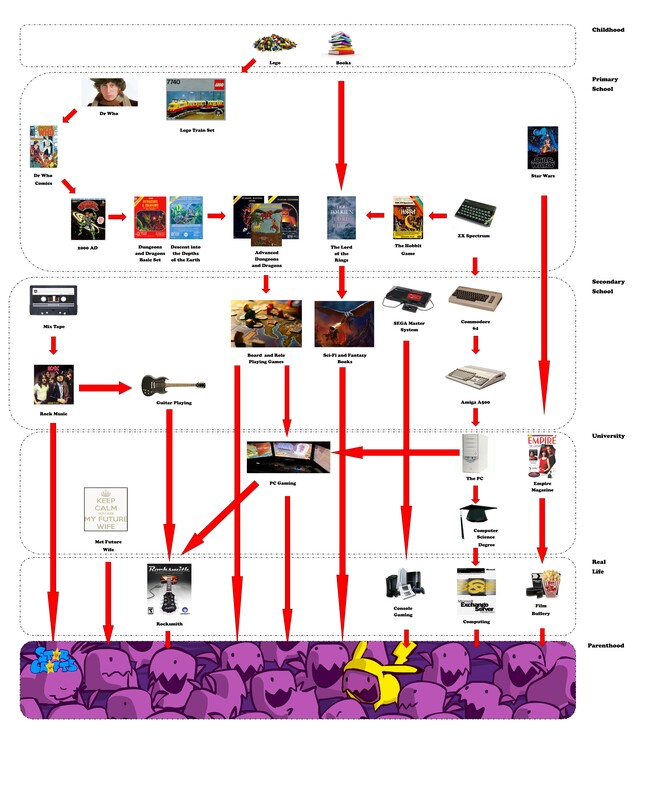 The original release of the Playstation was a ‘thing’ and from there I got into the console gaming cycle. PC gaming was always my true love though and I was able to unify it with guitar-playing via Rocksmith. Marriage, work and children. Though not in that order. And now I can show my kids all the call stuff I’ve learned about. They’re going to be better at it all than me though; they’re learning music themselves rather than how just to play along to stuff. Computers and the Internet are everywhere. Gaming, Sci-Fi and Fantasy are now part of the mainstream rather than niche oddities. I’m sure the students will become the masters!